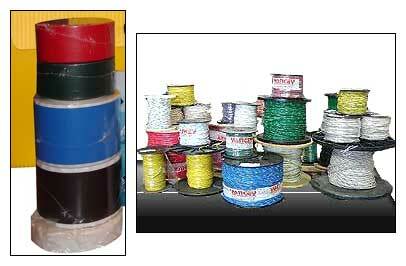 We are an exuberant Binder Tape Manufacturer based in India. Our binder tapes are manufactured from polypropylene granules by adding different color master batch. These cables are used for binding of units and super units for identifications purpose in telecommunication cables. The material has smooth surface with excellent compatibility with filling compound. The color of our binding tape is distinguishable under normal lighting conditions. Our binding tapes are free from moisture and dust and supplied in blue, orange, green, brown, grey, white, red, black, yellow and violet colors. The tapes are duly cheese wound on paper cores of different sizes as per customersâ�� requirements. The cheese wound bobbins are individually wrapped by polyethylene film, packed individually in cardboard cartoons and then packed in wooden boxes.